The Remke family of Multiple Hole Bushings are the answer when multiple conductors need to be terminated into one fitting. With over 300 configurations available, when you use Remke multiple hole bushings you’ll save both money and space by using a single bushing & cord connector instead of separate cord grips for each length of cable. Remke Multiple Hole Bushings are also available in Silicone. Silicone rubber is used in a variety of industries for its extreme temperature properties and chemical resistance.Silicone is an excellent electrical insulator and its composition makes it highly resistant to ozone, UV and heat. Industries that benefit from silicone rubbers include automotive, medical devices, aviation & aerospace, electronics, construction and industrial. 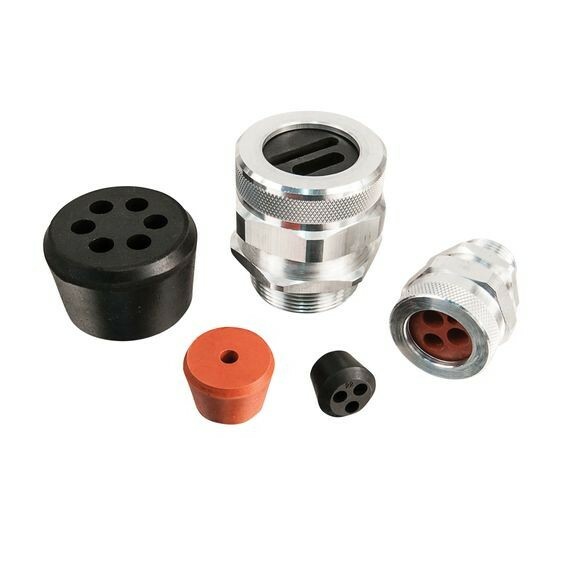 Any of our Multiple Hole Bushings can fit into any standard Remke cord connector made from aluminum, nickel-plated aluminum, steel, stainless steel, nylon or Valox®. Standard bushings are made from Neoprene but optional materials include silicone for high-temperature applications.